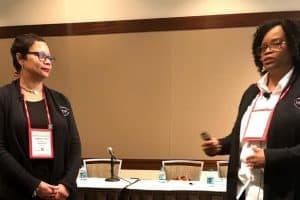 The room filled quickly for “Racial Equity: Libraries Organizing to Transform Institutions,” the Symposium on the Future of Libraries held during the American Library Association’s 2019 Midwinter Meeting & Exhibits in Seattle. Gordon Goodwin, Government Alliance on Race and Equity (GARE) Midwest regional project manager, urged participants to fill in open seats prior to beginning his presentation. Co-presenters included Amita Lonial, assistant library director, Tacoma Public Library; Sarah Lawton, neighborhood library manager, Madison Public Library; and Andrew Harbison, assistant director of collections and access, Seattle Public Library. Goodwin began by asking, “Why focus on race?” Infant mortality rates are 10 times higher for people of color than for their white counterparts, regardless of any other aspect of their identity. Race, zip code, and gender affect a person’s success across many arenas, such as education, health, and criminal justice. According to Goodwin, “Racial equity means closing the gaps so that race does not predict one’s success while improving outcomes for all.” Dismantling systemic racism will improve experiences for everyone in the same way the American Disabilities Act made things easier for everyone, including those without disabilities. Goodwin also pointed out that most people born after 1950 don’t talk about race. Why? We’re taught that it’s impolite to talk about race, and that if we don’t talk about it, it must not exist. Wrong. Ignoring race perpetuates implicit racism. Fair isn’t always equal, and people who face extra barriers need additional resources to have the same quality of life as others. Additionally, there is bias in library work both at the institutional level and the individual level. Explicit bias is generally easy to recognize. Implicit biases can be trickier to identify; while they may be unintentional, that doesn’t make them any less detrimental. 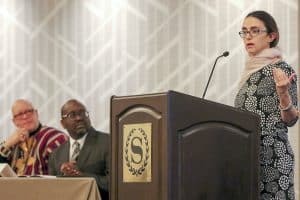 Institutional implicit bias comes in the form of policies that negatively impact one group more than other groups, such as “enforcement of fine collection disproportionately creating barriers to people of color, who are overrepresented among low-income populations,” Goodwin said. Individual implicit bias includes library staff who unintentionally waive charges for white patrons more often than they do for patrons of color. Organizing includes partnering with like-minded individuals in the community. Operationalizing involves creating a racial equity action plan. 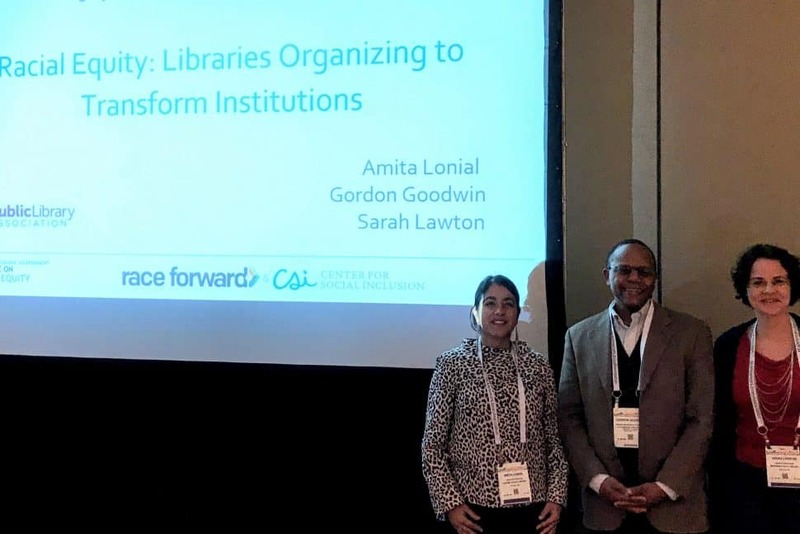 “Libraries are a predominately white space, [and] we have a responsibility to our communities to interrupt the systems of racism,” Lawton said. To learn more, check out the Government Alliance of Race & Equity Libraries Interest Group. LINDSAY GYPIN is access services manager at University of Denver Libraries.